Historia antica di Ricordano Malespini gentil’huomo Fiorentino dall’edificazione de Fiorenza per insino all’anno M. CCLXXXI. Con l’aggiunta di Giachetto svo nipote dal detto anno per insino al 1286. Florence: Nella stamperia de i Giunti, 1568. Ricordano Malispini belonged to a noble Guelph family banished from Florence after the battle of Montaperti in 1260. During his exile in Rome, he received manuscripts from his relative Fiorello Liello Capocci chronicling the history of Florence, which would become the foundation of this work. According to the title, Ricordano compiled the history from the foundations of the world until the year 1281, after which his grandson Giacotto continued the narrative until 1286. 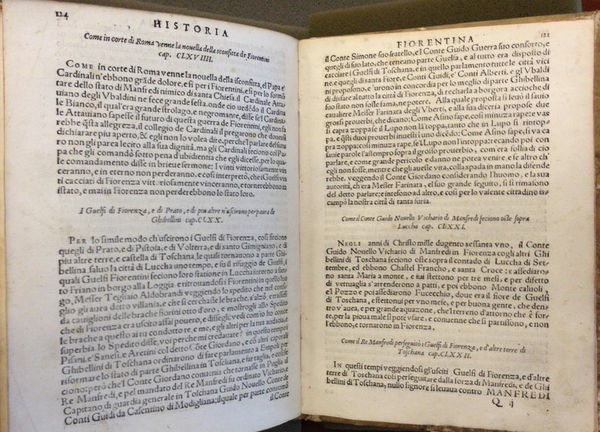 This copy is from the first printed edition of the text, published in 1568. Subsequent editions printed the work as Storia fiorentina, the title by which the text is generally referred. Much has been written about the chronology of Malispini’s Florentine history and the Nuova Cronica of Giovanni Vallani, and Dante’s possible knowledge of the texts. While Malispini purports to have written his chronicle in the late 13th century, prevailing opinion dates the text to the late 14th century and declares it derivative of Villani’s chronicle. See especially Davis, “The Malispini question,’ in Dante’s Italy and Other Essays, 1984, for a history of scholarship on these issues (found at call number PQ 4422 .D33 1984 in Hesburgh Library). Originally published by Tracy Bergstrom at italianstudies.nd.edu on March 19, 2015.